3X:Chemistry Rust Dissolver returns rusted surfaces to bare metal without harming the integrity of the metal. The viscous formula is reusable and will not harm plastic, rubber, seal, soft metals, or non-oxide coatings such as paint and chrome. Rust Dissolver works like an acid, but is safe for you and the environment. Rust Dissolver is ideal for removing rust from any part or surface that can remain damp with the product until the rust is gone! "How long does it take to remove rust?" The amount of rust dictates the dwell time. For light rust and heat related bluing - 30 min to 1 hour. Moderate rust - up to 4 hours. For heavy rust, up to 12 hours. "Can Rust Dissolver be reused?" Yes. Rust Dissolver can be stored and reused until the solution becomes inactive. You will notice this as the amount of time to derust a surface becomes longer. "Do I need to dilute Rust Dissolver?" No. Rust Dissolver is ready to use right out of the bottle. However, Rust Dissolver can be diluted by adding up to 10% water if needed. "Is it safe for all types of metals?" Yes. Although with soft metal, dwell time should be limited to only the amount of time needed to derust. "Will it affect galvanized, magnesium, or any other coating?" The general answer is yes. It can remove some coatings such as galvanizing if the product is left on beyond the necessary time to remove the rust. Once the rust is removed rinse the item and dry. It is suggested to test a spot on any type of coated metal for discoloration before application. "How much will one quart de-rust?" That depends on the amount of scale derusted each time. 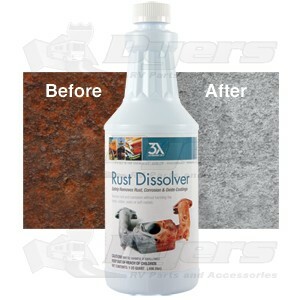 If Rust Dissolver is regularly used to remove heavy rust deposits, the life span will be shorter. If light rust is commonly removed, the life span will be greater. "Will Rust Dissolver remove paint?" Paint and other non-oxide coatings that are well adhered to the surface will remain in tact. "What if I get Rust Dissolver on a painted surface?" If the painted surface is not going to be stripped later for reapplication of the top coat, Rust Dissolver should be wiped off as soon as possible, as some staining/etching of the painted surface can occur. "Why does Rust Dissolver foam?" Soft metals, such as pot metal, tend to foam due to the reaction of the Rust Dissolver with the softer compound. Rust Dissolver will also foam when applied through a pump system. "How do I dispose of used Rust Dissolver?" In most cases it can safely be put down the drain. Do not dispose of in storm sewers. If applied to large areas wipe off excess product with rags prior to rinsing the surface. Dispose of the rags. The iron content of the solution will dictate the disposal method. Always dispose of the product according to local, state, and federal regulations. "Why did I get some flash rusting?" Flash rusting occurred because the pH of the surface was not neutralized, and may contain a higher concentration of acid in those areas. Reapply Rust Dissolver, rinse and use a neutralizer or top coat for best results. "Does Rust Dissolver need to be neutralized?" Yes. Some surface flash rusting may occur directly after derusting and rinsing. Using a neutralizer, or prepping the surface immediately after using Rust Dissolver is recommended for best long term results. "Will it harm septic systems?" No. The acidic nature of the product will actually be beneficial to the septic system. "Will run off hurt shrubs and plants?" It can because it may change the pH of the soil which could affect the plants and shrubs. It is suggested to avoid run off into these areas. Remove excess oil and dirt from the surface, then rinse and dry the item. For best results, use a wire brush to remove flaking and large rust deposits before application. Rust Dissolver can be applied using several methods. The key is to keep the rusted surface damp with the product. We recommend application in temperatures above 50°F. Using a plastic pan, tub or bucket, immerse item fully or partially in Rust Dissolver solution. Regularly check progress until rust is dissolved. Using a foam applicator or common paint brush, dab Rust Dissolver over desired area until surface is well coated. Regularly check to ensure surface remains damp. Reapply as needed until rust is dissolved. For large areas, Rust Dissolver can be applied using a catch and return system with small submersible pump.